1 Rinse rice in a sieve with cold water until the water runs clear. 2 In a saucepan, cover rice with 550 ml (approximately 1 pint) of water; bring to a boil and cook for 1 minute. Let steam, covered, on the stove for 20 minutes. 3 Bring vinegar, sea salt and sugar to boil. Transfer the rice to a large bowl and spread apart slightly to help it cool down. Season with the vinegar mixture to taste. Let cool completely. 4 Meanwhile cut salmon and tuna into thin strips, about the width of a pencil. 5 Halve cucumber and scrape out seeds with a spoon. Cut cucumber the same width and size as fish strips. Halve avocado, remove pit, and cut the flesh into strips. If desired squeeze a little lemon juice over the avocado to prevent it from turning brown. 6 Fold 1 sheet of nori in half and tear in half crosswise. Lay a piece, smooth side down, on bamboo mat. Moisten hands and spread the sheet with a thin layer of rice, leaving a small border of nori uncovered so that the rice does not fall out while rolling. Press down gently. Add a thin stripe of wasabi paste. In the center of the rice, lay 1-2 fish and/or vegetable strips. 7 Place the filled sheet of nori on the lower edge of the mat. Use the mat to help you roll, while holding the filling with your fingers. Lightly press the mat after the first turn. Moisten the top edge of the nori sheet with water, lifting the mat, and finish rolling the sushi. 8 Using the rest of the ingredients, make another 7 rolls. To serve,(each roll will serve 1 person), cut crosswise into bite-sized rolls. 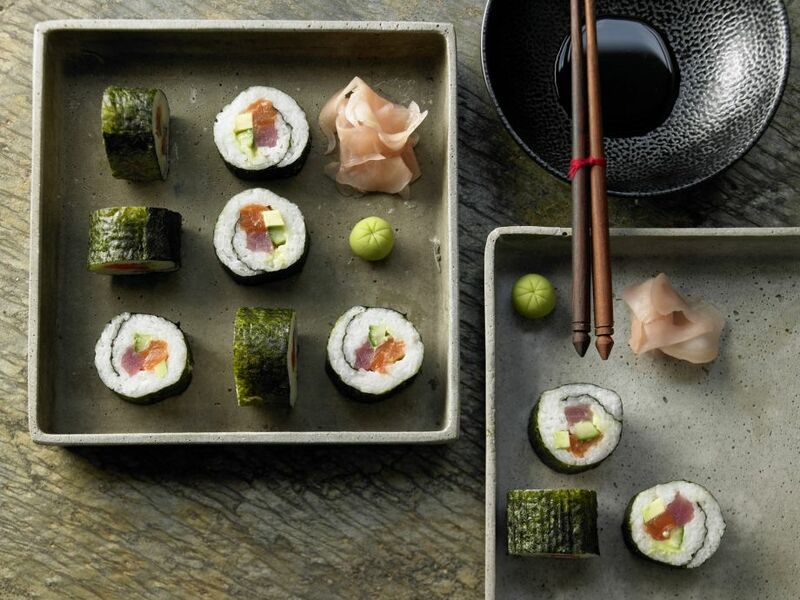 Serve sushi cut side up, with soy sauce for dipping, pickled ginger, and extra wasabi paste.